The folks at Source Gaming have given us the permission (their site is down again) to republish their full translation for Masahiro Sakurai’s latest Famitsu column, detailing the variety of newcomers in Super Smash Bros. Ultimate and how Isabelle was developed. This was previously reported by us earlier today. You can check out the full column below. Note: Do not repost the full translation. Please use the first two paragraphs, link to this translation, and credit Source Gaming. The following is a selection from Famitsu. This translation is for fan use only, and may not accurately reflect the opinions of Masahiro Sakurai. If you enjoyed this article, I would strongly encourage you to support Sakurai by buying his books. Source Gaming does not run ads on its website. Come say thanks on our Twitter or subscribe to our YouTube Channel! It’ll make our day! I apologize for the one-week delay. The earthquake in Hokkaido led to a delay in the Nintendo Direct broadcast, so I had no choice but to hold off on publishing the article I had written. Anyway, Isabelle has joined the fray in Super Smash Bros. Ultimate! More than anything, I’m sure you noticed just how cute her movements were in the trailer. The more motion, the better. …That said, if you were thinking that we’d just be dropping a bunch of newcomer trailers all the way up until release, you’d be sorely mistaken. We may have gone a little bit overboard up until now, so we’re going to slow our pace from here on out. 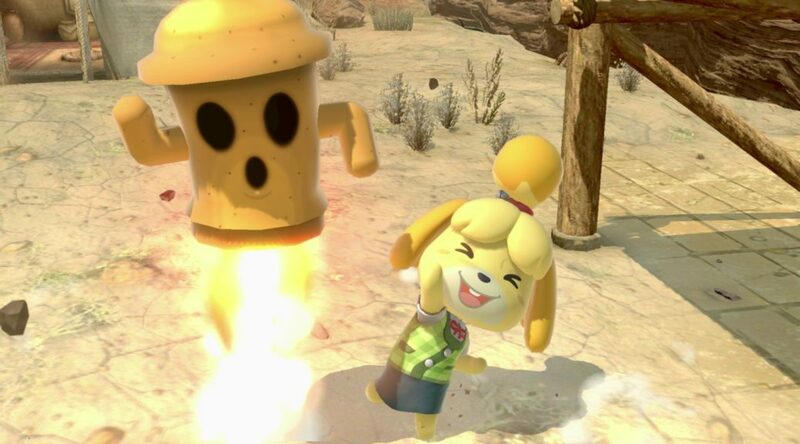 For those who speak Japanese, you’ll notice that Isabelle appears in Ultimate without her -san honorific. Dedede and Bowser both lack their “Great King” epithets, much like Zelda and Peach are referred to without the title “Princess.” As a rule, we remove all honorifics in Smash and just refer to a character by their unique name. Of course, if players want to refer to her as Shizue-san in Japanese, I won’t stop them. In fact, I encourage it. Isabelle is based off of Villager. She pockets items and rides on a balloon swing. However, she is not an Echo Fighter. This is because Isabelle and Villager have fundamentally different body types and personalities, so we couldn’t have made her an Echo. All of her animations are different; not a single one is the same. Isabelle first appeared in 2012’s Animal Crossing: New Leaf. She and the human characters were a little taller and slimmer than characters in previous installments in the series. Her appearance in Ultimate is largely based off those proportions. By comparison, Villager is slightly shorter and stouter. When we were making Smash for 3DS/Wii U, we debated using the New Leaf proportions when designing Villager, but we went with the more fleshed-out earlier model. There were two reasons behind this decision. One is that a slimmer Villager would be thinner than Mario, and that wouldn’t fit the character. The other reason is that, since Animal Crossing games are played from a bird’s-eye view, it makes the characters’ bodies seem shorter than they actually are. We actually received a request from the Animal Crossing team to lengthen Villager’s neck a bit. Honestly, I didn’t want to do this since each game has a design that fits best, but fielding these types of requests and making them work is what Ultimate is all about. Smash is a thoroughly strange game. It’s chaos. The things we look for in a character or stage change by the minute. Cool things must be cooler. Cute things must be cuter. But we also have to get rid of the incongruous feeling of these two types of things coexisting. In that sense, work is never boring. The job demands dexterity, flexibility, and a range of skills from the team, but there are few jobs filled with as much change as this one. What is “cool”? What is “cute”? I don’t think they can be explained by physical appearance alone, but rather I think they encompass things that are both tangible and intangible. That’s where I think playing a bunch of games and getting a feel for these things comes in handy. The characters in Smash all come from their own titles, many of which are from quite a while ago. However, if you only focus on rigidly following the original titles, you won’t be able to make something appropriate for the present. You have to know the current standards, create something that fits today’s environment, and strike a balance with the past. I think this is absolutely essential. Smash is quite a stew of different characters, but I try my best to maintain some sense of unity among them while creating a game that can stand on its own by today’s standards. And we should be finishing up development soon…I hope!